More than 6,500 people have been injured, according to the National Emergency Operation Centre. 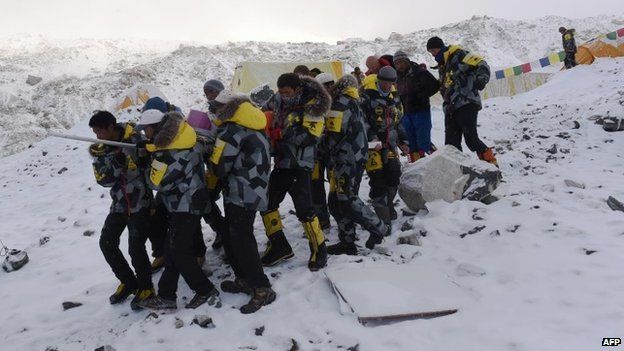 More than 200 climbers have been rescued around Mount Everest, which was struck by deadly avalanches in the 7.8-magnitude quake. 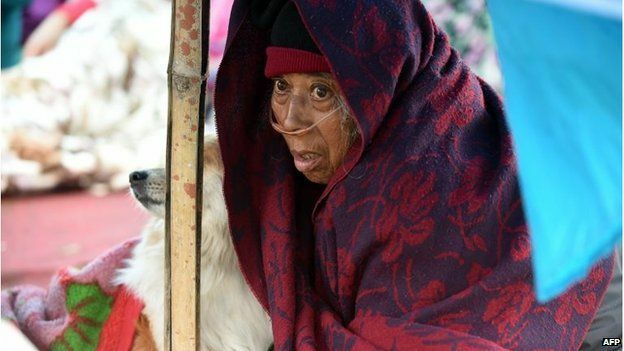 Vast tent cities have sprung up in Nepal's capital, Kathmandu, for those displaced or afraid to return to their homes as strong aftershocks continued. Thousands spent Sunday night - their second night - outside. Initial reports suggest that many communities, especially those close to mountainsides, suffered significant quake damage. "Villages like this are routinely affected by landslides, and it's not uncommon for entire villages of 200, 300, up to 1,000 people to be completely buried by rock falls," said Matt Darvas, spokesman for aid agency World Vision. 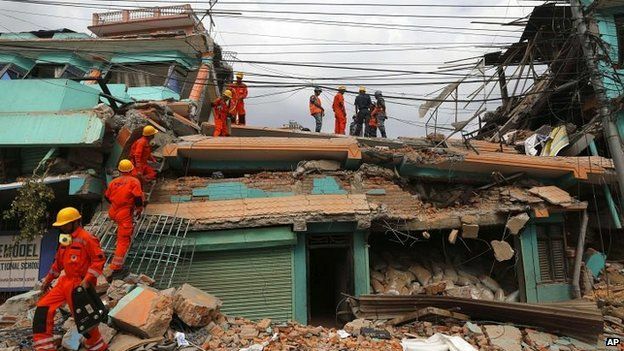 A man evacuated by helicopter to Pokhara, 200km from Kathmandu, said almost every home in his village of more than 1,000 houses had been destroyed, Mr Darvas told the BBC. In Dhading district, 80km west of Kathmandu, people were camped in the open, the hospital was overflowing, the power was off and shops were closed, Reuters news agency reported. A senior official in Gorkha district, the location of the earthquake's epicentre, told AP he had heard reports of 70% of houses being destroyed. "Things are really bad in the district, especially in remote mountain villages," Udav Prashad Timalsin said. "There are people who are not getting food and shelter." 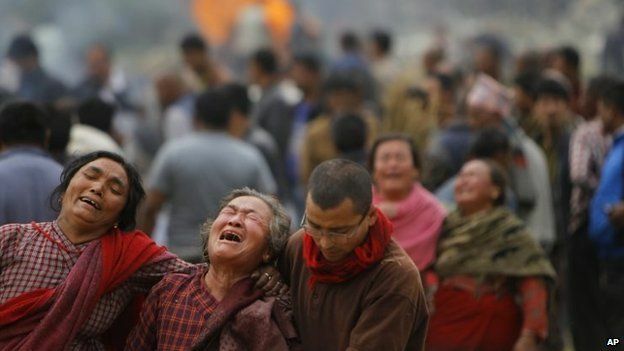 Among villages affected are some inhabited by Tibetans, many of whom have sought refuge in Nepal. 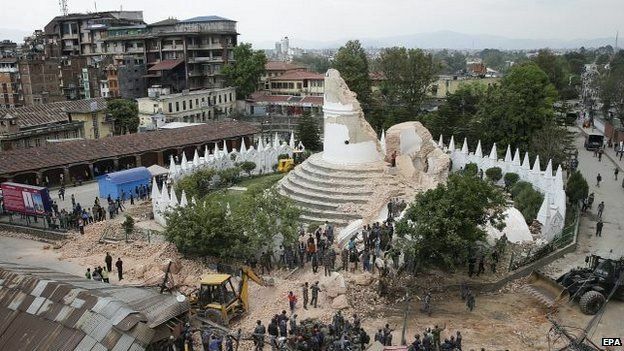 Bridim, north of Kathmandu, is reported to have been virtually flattened. The roads to where the epicentre was, northwest of the capital, have been cleared and rescue teams are on their way. Rescue missions and aid are arriving in Nepal from abroad to help cope with the aftermath of the earthquake, the worst to hit Nepal for more than 80 years. 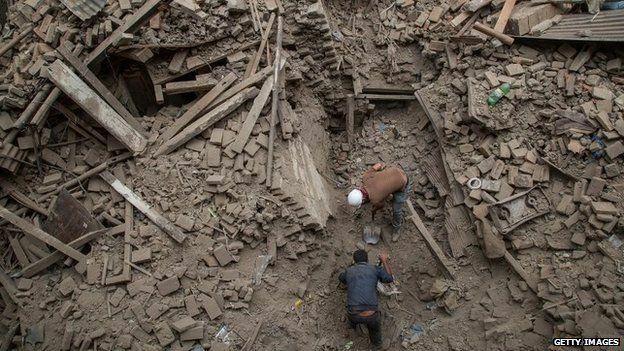 Efforts to dig victims out from under the rubble of collapsed buildings in Kathmandu are also continuing. After a cold and wet night, the skies have cleared over Kathmandu allowing rescue teams to continue working. But it is becoming harder for the hundreds of thousands sheltering out in the open. Many are staying in very basic tents with little protection. Water is becoming scarce and there are fears that children in particular could be at risk of disease. Even residents of some of the city's smarter neighbourhoods are sleeping on carpets and mattresses outside their homes. Aid flights are coming in rapidly and in fact Kathmandu airport is running out of parking bays, so many aircraft are having to wait before getting permission to land. And at the Pashupatinath temple, one of the city's oldest, cremations have been taking place since the morning. As the death toll rises, the authorities are keen on disposing of the bodies as quickly as possible to prevent a health hazard. 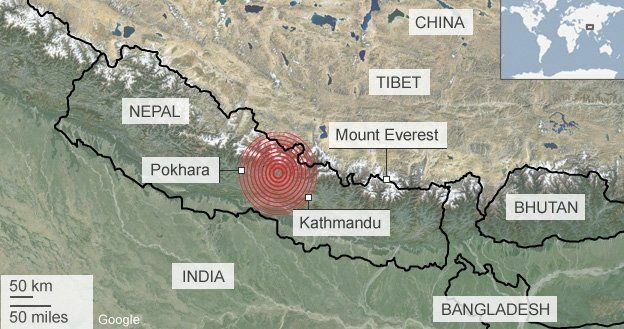 A powerful aftershock was felt on Sunday in Nepal, India and Bangladesh, and more avalanches were reported near Everest. The 6.7-magnitude tremor, centred 60km (40 miles) east of Kathmandu, sent people running in panic for open ground in the city. 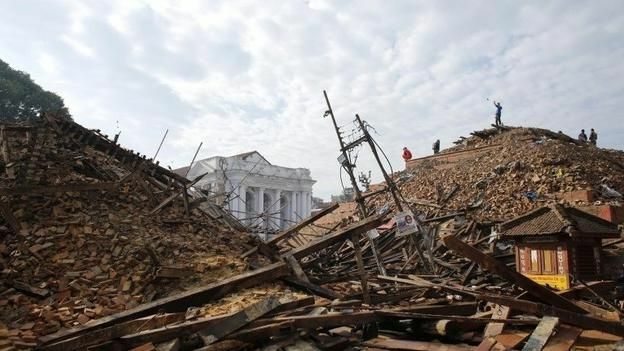 It brought down some houses that had been damaged in the initial quake. At hospitals rattled by the aftershocks, staff moved sick and injured patients outside on Sunday afternoon. The rescue of climbers stranded on Mount Everest came as the weather cleared on Monday morning, allowing more helicopters to head to Base Camp. Foreign climbers and their Nepalese guides around Mt Everest were caught by the tremors and a huge avalanche that buried part of the camp. At least 18 people were killed and 60 more injured; others are still missing. 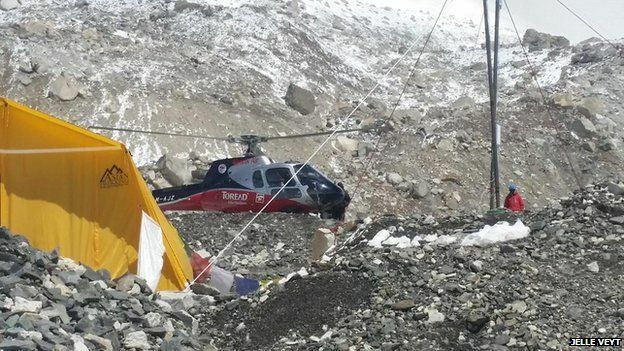 Belgian climber Jelle Veyt tweeted that helicopters had been removing climbers from camps 1 and 2 to Base Camp throughout Monday morning. There are 14 international medical teams on the way to Nepal, the UN says, and up to 15 international search-and-rescue have been sent. The UN children's agency says nearly one million children in Nepal urgently need humanitarian assistance as they were particularly vulnerable. The country is running out of water and food, and there are frequent power cuts, the UN says. Heavy rain earlier on Saturday further worsened conditions with UN officials expressing concern that thunderstorms that could harm people staying outdoors and lead to a shortage of vaccines against disease including diarrhoea and measles. Victims from other countries include a dead Estonian national and a Japanese man killed.